Seriously, how good was that tournament?!? Loved every moment of it. NHpeter, Critical_Lemon, bwtcf, TheHun and 5 others endorse this! NHpeter, Critical_Lemon, bwtcf, TheHun, Lonegunmen, kwlap, Big Pete 65, Bevan, and keefy_NZ endorse this! Junior82, Lonegunmen, and kwlap endorse this! Prob go our good mate Adama Traoré or Pereira. Women's WC going on now. Round of 16 starts later on this morning. Very enjoyable games in Wgtn despite the weather. Had a discussion about how these U20s would go in the A-League. My opinion was that they would struggle against the better teams, as after all they are still kids. they'd show flashes of individual brilliance but trying to predict how well they'd do is akin to looking down a corridor of uncertainty. Although some of their thought processes... BOOM! Awesome effort to get to that many games. I tip my hat to you. Lonegunmen, Big Pete 65, and bwtcf endorse this! And note Patrick "had" to get in the picture too. - Media hog!! ;) Well done Dave, Dale & Tracey, very well done! patrick478 and Big Pete 65 endorse this! And Fiji were arguably the weakest team in the World Cup (along with North Korea and Mynamar). New Zealand: finished in the top 16 teams ahead of Argentina and Mexico as the best of all the third placed teams in group play. Ahead of Argentina, Colombia, Mexico, Hungary etc. Ahead of Argentina, Colombia, Uruguay, Mexico, Austria, Ghana, Senegal, Honduras etc. No one would have predicted that before the tournament. FIFA spent 22 million dollars on the tournament; the NZ government 5.5 million dollars. FIFA Director of Competitions, Colin Smith, reiterated Mr Beeche’s comments giving New Zealand a huge thumbs up for its successful hosting of the tournament. - Nine FIFA international standard sand-based training pitches across New Zealand. - Goals, team benches, dug-outs and training equipment worth $140,000 provided to Football Federations. - Futsal court worth $50,000 provided to New Zealand Football. The German team management described the training venue pitches in Christchurch as "senior FIFA World Cup venue standard"
"More than 40 scouts and coaches have been in this country, including some from Man City, Liverpool, Bayern Munich and Juventus. " It's a good level and there is lots to see," said Peter Hyballa, a youth coach and scout for Beyer Leverkusen ( 3 years coaching Borussia Dortmund U-19). Hyballa has clocked up thousands of kilometres travelling throughout NZ. "Some of the big players you have already seen before, but there are always surprises. Every small country there are one or two players, and then you tell your manager, "Hey this no 9. from Myanmar is not too bad.." Leverkusen have had two two scouts plus Hyballa here. (He) has compiled a dossier of 30 prospects from the tournament, which has been passed on to his club...' etc. And yet how would these young uns handle getting monstored off the ball by Siggie, turned inside and out by Roly and being stretched by Burns before Krishna blasts the ball into the back of the net? And what them Tards eh? Nice photos enzo (blog linked on the homepage). I got to 15 games in four cities, and loved almost all of it. Ghana v Argentina 3-2 at Wellington was my favourite. Among the highlights for me: Pace, skill and flair of African teams, the quality of a lot of the goals, NZ making 2nd round and giving a very creditable performance against Portugal, Fiji's win, Myanmar supporters and overall attendances. 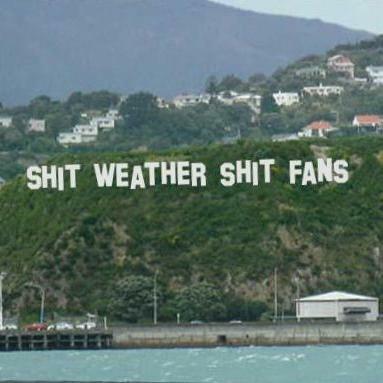 Lowlights: not many but include weather in Wellington (really were unlucky) and the piss poor media coverage. Would love to see the women's WC in NZ. I think we've shown we could do a good job of it and I think it would be well supported. Tegal, bwtcf, TheHun, and otagolad endorse this! Fell at the the last hurdle Junior. Ernie has been reported that Krishna will suit up for Fiji instead of the Nix. One less not-a-striker to put the ball in the back of the net.